I think every person I’ve ever met has at one time in their life suffered the dreaded tupperware cupboard nightmare. Forget the fear of someone discovering skeletons in your closet, it’s the food storage containers you really need to keep hidden. Now, before a friendly Tupperware sales lady jumps down my throat, no, all food storage containers are not Tupperware. 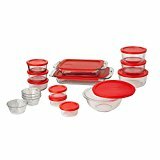 Tupperware is a specific brand of high quality food storage containers, and if I had the money for it, I’m sure it would fit nicely and neatly all on its own. 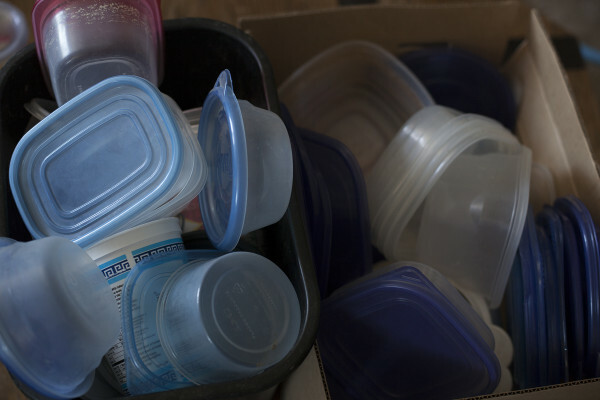 In fact, I kind of imagine real Tupperware as having magical qualities that enable it to wash, dry, and organize itself like a scene from Harry Potter. Any real Tupperware I own was gifted to me, and has since lost such magical powers. 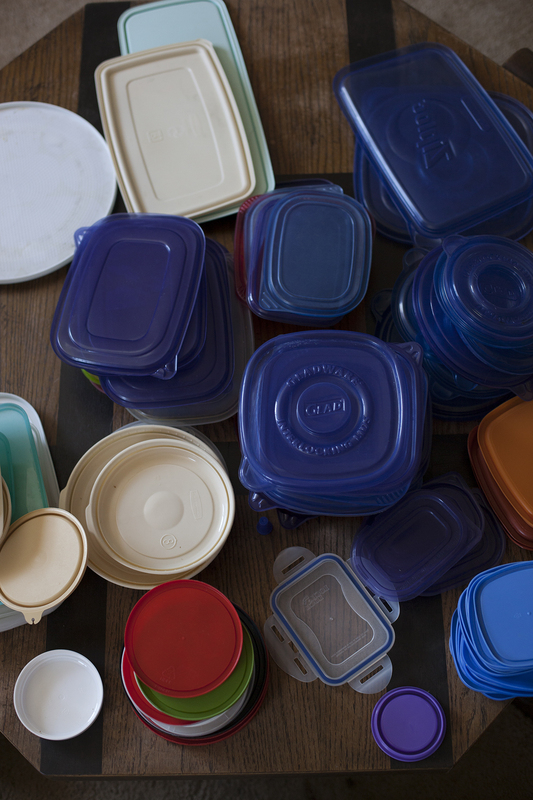 Like Band-Aids, Kleenex, and Velcro, Tupperware has come become so known as a the heavy-weight in its class, that everyone pretty much refers to any food storage container as tupperware. Note the little “t”. This is to signify that I own the cheap stuff. The stuff that doesn’t stay organized. The stuff that somehow multiplies like bunnies, reproducing either lids or containers, but never at the same rate. I know, it’s a serious problem. Two months ago I got on an organization, downsizing, and cleaning kick. I’ll devote another post to that, but today I just had to share my tupperware cupboard because I’m beyond thrilled that it has actually stayed organized for over a month now. For those of you who have fought to tame the tupperware beast, you know that this is nothing short of miraculous. SO……here’s my easy 5 step system! Pull all of your tupperware out of the cupboard (dishwasher, counters, under the bed) and put it into whatever “bins” you have (boxes, laundry baskets, a Pack ‘n Play, etc). Wipe out the cupboard. Groan and shake your head in disbelief at how much you actually own. 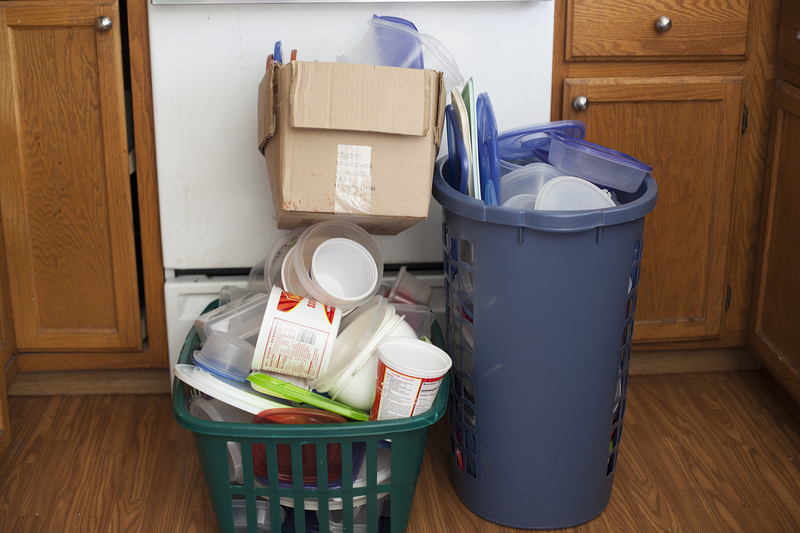 Find a good working surface (dinner table, coffee table, couch, only use the floor if you’re going to wash everything) and start separating the lids and containers. Stack them by type: large round lids, small round lids, square lids, etc. Don’t worry about inspecting it yet, that’s in the next step. Begin matching containers to lids. Start with like piles, for instance, the large round lids and the large round containers. As you match, inspect for quality. Have a recycle bin or box nearby to place anything that is cracked (yes, even if “it could still work”), warped, melted, or stained. 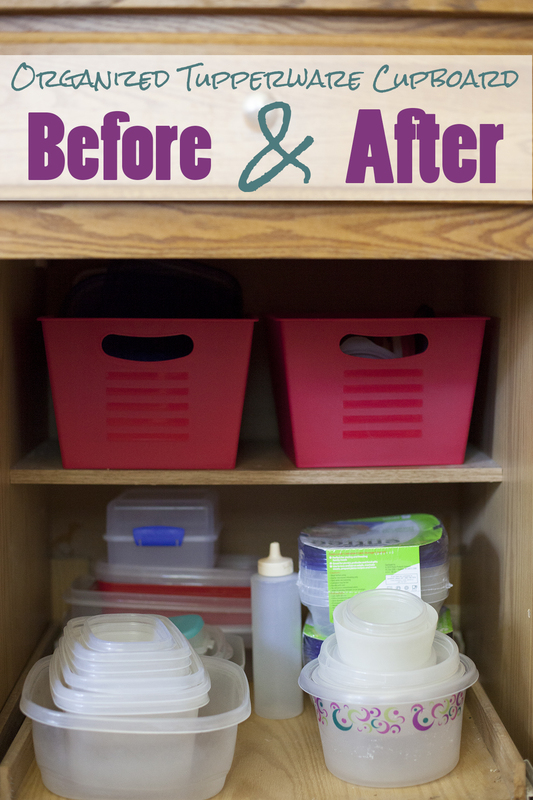 Place lids on their containers and put them back into the “bins”. Now it’s time to put away the select few items that made the cut. 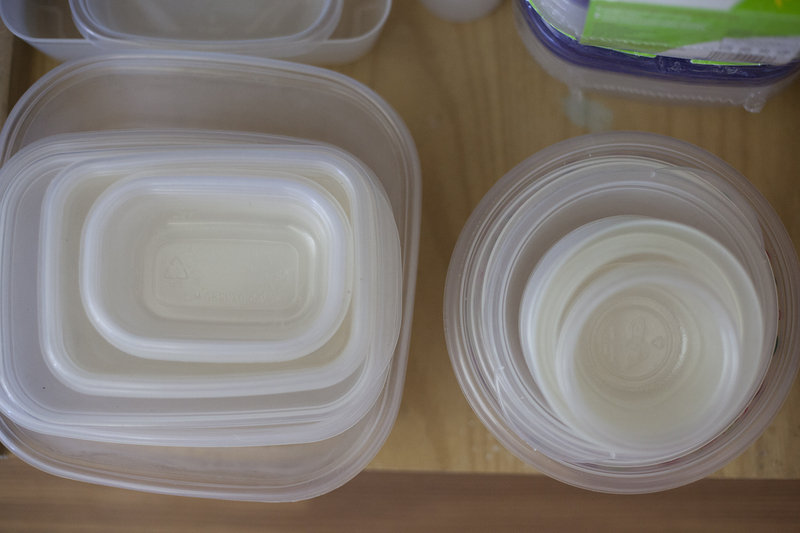 Depending on your space, use two or more containers to hold lids. I got two bins from the Dollar Store, talk about cheap organization! I put large lids in one, smaller lids in the other. Then stack your containers by type into neat piles. DONE. It’s easy, once you get past the horror of realizing what a tupperware hoarder you apparently were. Like I said, this works. 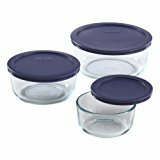 Once I walked Eric (our self appointed dish washer) through the strategy of where to put the lids and stacking the containers, it was easy. No more tossing containers in and slamming the door. No more holding your breath to ready yourself for a recyclable avalanche every time you want to pack a lunch. We are free from the tupperware cupboard nightmare!!! 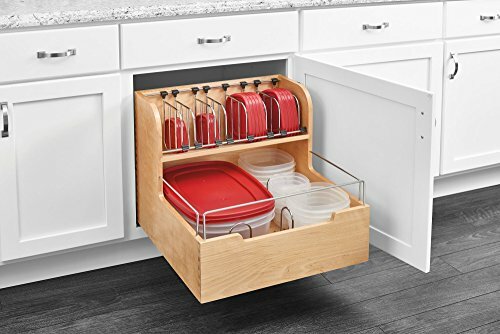 Do you have a tupperware cupboard from H E Double Hockey Sticks? Or do you have a system that works? I’d love to hear in the comments! While we still use this same bin storage system, and it continues to keep us organized, we’ve upgraded our food storage system to glass containers. Here are some of our favorites. These are affiliate links, so if you purchase ANYTHING from Amazon using one of these links, we get a small commission without it costing you anything extra. Thanks for supporting our family business! Or if you’re not on a dollar store budget, go all out and really pimp out your cupboard! Are you a busy mom on the go? Make sure to sign up for our newsletter for more kitchen tips, healthy recipes, cute kid food, and mom to mom encouragement. We’ll even give you a free download of 10 kitchen hacks to save you time and money. Because we could all use a little more of both! Not yet! I am doing a MEGA reorganization of my home, and pots and pans is definitely on the list. I used to have a pot and pan rack hanging on the wall, but we put bookcases there to make a pantry, so right now my pots and pans are a pain. Promise to do a post when I figure out something that works. This looks FANTASTIC and is inspiring. I love your sweet sense of humor and simple steps to follow. I know this option isn’t for everyone. But I asked for tupperware (lowercase t) for Christmas one year, we’ve supplemented the stash by only buying the same brand. There are 4 basic sizes; short and small, deep and small, large and shallow and then a large and deep one. The best part is that 2 lid sizes that fit everything. It’s SO EASY TO ORGANIZE when you are only working with one brand. And of course I’m a HUGE fan of clear/see thru plastic so you can see what’s in the fridge and be more likely to eat it up! 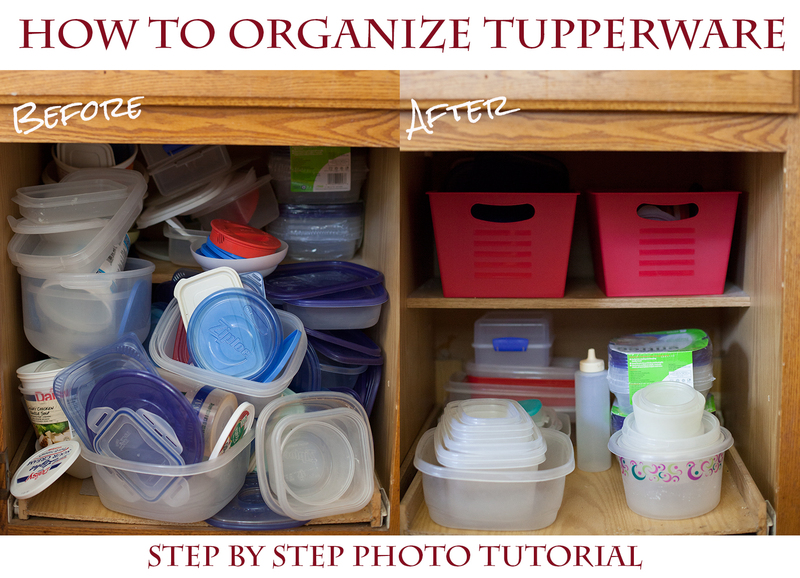 I know a lot of people that struggle with their own tupperware drawers and organization. There’s hope for all of us eh? Great article! Just applied it to my own tupperware nightmare. And more for chuckle, than a nitpick. Otherwise, what did the plastic people ever do to you? I’ve found it helps to only buy square containers (cabinets are square, refrigerators are square), and try to buy the same brand each time. Hi Beth, so sorry I’m just now replying. We got way behind on comments with our new baby! That is a great tip. LOL! Lids and containers are like socks. Always end up with odds & sods. Thanks for the tips. May I add that the lids that don’t have a storage container mate are GREAT for putting underneath indoor plants? They’ll keep the excess water from getting everywhere. Hi Kelsey, so sorry I’m just now replying. We got way behind on comments with our new baby! What a great idea. I have ruined a few things from indoor plants. I will try this! I took a permanent marker and numbered containers and matching lids, that way I know at a glance which lid fits the container! Hi Connie, so sorry I’m just now replying. We got way behind on comments with our new baby! That’s a really great idea. I need to do that too! I love the information on organization of tupperware. Where will I find the other organization blogs. Thank you and have a wonderful day. Hi Carolyn, so sorry I’m just now replying. We got way behind on comments with our new baby! I didn’t even realize that I haven’t posted additional organization recipes as promised. I will put that on my calendar since this one has been so popular. Thanks for stopping by and commenting! Loved this blog! Hubby and I went though all of our Tupperware and other brands of plastic containers a short while ago. We got rid of all products that are not BPA free, including the old, expensive Tupperware. We set the remainders all out on the kitchen island and did pretty much what you did, matching them to lids. We tossed what we didn’t need any longer, and decided which of the old ones we wanted to replace with the new BPA-free containers. I am fortunate to have many drawers in my kitchen, so I have a drawer for small containers, one for medium containers and one for large containers. Those huge bowls go in the Lazy Susan corner cupboard. Guests soon learn where to find whatever sizes they need and that makes having helpers in the kitchen actually helpful instead of more work! looks like a great idea, I am decluttering my cupboards and find I am overloaded with them. After matching all my containers and lids I labeled each set with a permanent marker; lid (a) to container (a), lid (b) to container (b) etc. The letters eventually wear off, so be sure to re-mark immediately. Such a great tip Chris. We just went through these organization steps again after three years. I’m going to go back in and try writing on the lids. I like it! Since I keep my plastic containers in an upper cabinet, they used to all fall out at me when I tried to grab one. I sorted all the containers and simplied down to 3-4 sizes. The container bottoms all fit inside one another and I keep the lids in a zip style large plastic bag. I just pull the bag down, open and remove whatever lid I want. Nothing’s falling out of the cabinet any more. Such a great system Linda. Maybe I’m the exception, but I tried marking mine with a permanent marker but they eventually ware off, my containers get washed way too often , I recently redid my “tupperware” cabinet and used old or odd colored fingernail polish. It seems to be holding longer. I’m sure it will eventually ware off too, but I have to redo this cabinet every other month or so (to shake off the strays). Lids: I was about to ask the question. I like the a to a, b to b approach real sense: keep to square containers, more logic. Looks like bye bye round ones.